Started a peddler in Hamamatsu. Opened store "Hiyoshiya" in Minami-ku,Nagoya. The chilled coffee "Kikuno IFC Coffee" went on sale in the business world the first. Brought a machine to measure an inherent vibration frequency(wave) to the laboratory. Get a patent in China. Patent of Quick Freezing manufacturing method for Coffee.
" Sujahta TOMI Medium Ice Cream" went on sale. All plants acquired ISO 9001. Established the factory in China. Supported to "International Patisserie Grand Prix 2009"
Established Rizhao Minglao Food Co., Ltd. Completion of Chiba second factory. 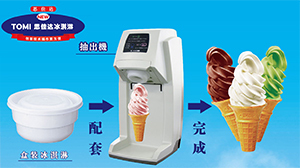 Start selling the TOMI Sujahta Medium Ice cream in Shanghai, China. Formal registration of Sujahta CM melody in " Sound Trademark"